Cork has had a conceptual facelift, thanks to new owners Stephanie and Jeff Rennells. Instead of the old wine shop vibe, you’ll find plenty of seating for socializing and 48 wines on tap at all times. If you’re not a connoisseur, don’t stress. 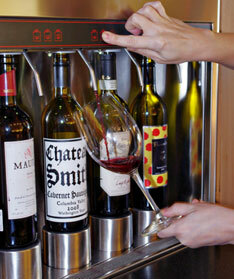 The Rennells want the bar to be an enjoyable experience for all levels of vino lovers. A handful bottles are selected for happy hour Monday through Thursday and glasses and bottles of bubbles are 10 percent off on Sundays.